The rush is over, sales have slowed way down and you’re either panicking, wondering where everyone has gone, or you know there are ebbs and flows to every business season and that you can use this downtime to your advantage. When I worked in retail, January/February were painfully slow and it made it even harder coming off one of the busiest times of the year, Christmas shopping mayhem. Motivation, sales and busy work days were hard to come by but working for an organization that had been through this year after year, they knew what to expect, didn’t freak out over a drop in traffic or sales and dealt with the downtime accordingly. This downtime can often be when small businesses call it quits. You’re putting in your best efforts but just not seeing the results you’ve come to expect which can lead you to feeling like it’s not worth it or wondering what you’re doing wrong. It’ll be a lot easier to get through this time if you come to terms with the fact that business is going to be slower. It happens to everyone; businesses big and small. You can’t force people to buy your product or service in a time they don’t need it, so become comfortable with the fact that activity is going to drop at some point and know that it will pick back up again. It may take double or even triple the amount of phone calls, emails or posts it normally does in order to get a response but take the time to really celebrate it when it does come. You should also take this time to reflect upon the triumphs you’ve had throughout the year. When we’re in our busy period, we often don’t stop to reflect and truly recognize our achievements; the amount of products you produced, the connections you made with other crafters, the sales and all the customers you brought joy to. Big and small, you have a lot of accomplishments; take this time to truly celebrate them. Think of all the connections you made through past transactions and events and get in touch with those people. Send thank you notes to the people who supported you in the past year or offer them a special discount as a thank you. 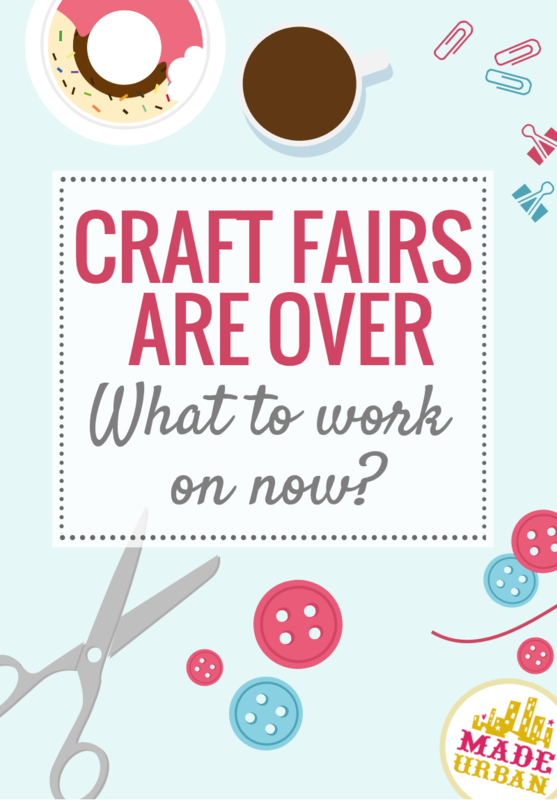 Follow up with other vendors you chatted with at craft shows and see if there’s an opportunity to collaborate. Email that store owner who stopped by your booth and see if you can bring in some samples and talk about the possibility of them carrying your line. Who have you wanted to reach out to or thank that you haven’t found the time to do so yet? Christine Kane is a blog I love to follow and one of the analogies she uses is “leaks” in our lives. These are the things that constantly nag at you but maybe aren’t an absolute essential to get done. Having spent the first year as new home owners, focusing on renos, I could instantly relate to what a leak was. For me it was the un-caulked baseboards, the outlets that needed to be updated, the scratch in the wall from moving the fridge that needed to be puttied. We lived in a completed home and most people wouldn’t notice these “leaks” but to me they were a nagging to-do list I walked past everyday that took up just a little bit of my energy. In business, these leaks may be; receipts you need to file, updating photos on your website, organizing your Pinterest boards or any other tasks that have been on your to-do list for weeks, continuously being pushed to “tomorrow”. Now is the perfect time to get rid of those “leaks” and start your new year fresh. You have no idea how good it will feel to get those pesky monkeys off your back. Look back on the past year of business and be critical about which products worked and which didn’t. Maybe you started your business with the intent of selling prints of your photography but continuously had people asking if you photographed weddings. Explore this new possibility and see if it’s a viable business plan for you.Take the time to look through Google Analytics and determine which products website visitors clicked on the most. Is there a way you can optimize the page to encourage more sales? Have another look at your product’s prices; do they still turn a profit or has inflation caused your costs to go up while your prices have remained the same? Sometimes we get too settled into our business and forget why we’re doing something a certain way; “Because I’ve always done it that way” is not a good reason. You need to constantly analyze and keep an open mind about what will be best for business, not what you think is best. If you allow yourself to be honest and open, your business will be guided to its unique position making it a perfect fit for you. Take the time to explore different creative avenues and become motivated by other people’s art. Enjoy music, visit art galleries, take in a play or let nature inspire you. Try to get away from the medium you usually work with and see if there are any techniques or ideas you can take back to your products. A pottery class may inspire some clay pieces in your jewelry line while learning to knit may open our eyes to different textures and patterns that could be mimicked. You can also use this time to take some classes and fine tune your skills; just have fun with whatever you’re doing. As well as overall improvement. How can you improve your products, step up your craft fair display and work on your sales techniques? If you’re looking for ways to refine your products, which can help with streamlining your entire business, download our FREE Chapter: MAKING PRODUCTS THAT PROFIT. Download the rest of our e-book: MAKE MORE MONEY AT CRAFT FAIRS to discover tons of tips, tricks and best practices for making more sales before, during and after a craft fair. you should be working on when you’re feeling stuck. Think about the things you can do now, to be better prepared for the busy times that are around the corner. Stock up on supplies, order more business cards, build up stock (even though you don’t have a consumer at the moment), plan your product lines for the upcoming season, research the craft shows you want to apply to; anything that can be done ahead of time, do it now. haven’t had the time to. Spend some time reading, relaxing, getting outside, decorating or socializing…and don’t feel guilty about it. isn’t alone. Take a breather and enjoy a slower pace of life while it’s here! Very good advice. I like to stock up on inventory and get all the “to do”lists worked on in my slow time. Thanks Claire! That’s a great time to build stock and cross off some to-do’s!